Set it and forget it. That’s what we wanted from a program that would reduce our social media workload and surface the Storybench archives. 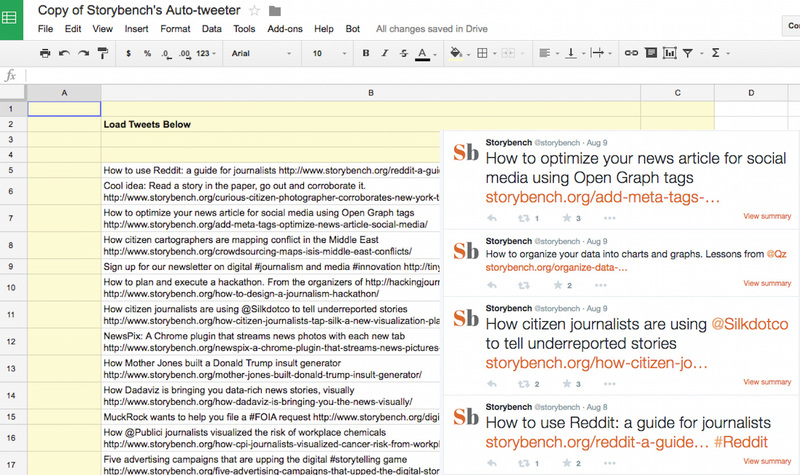 Much like the “scheduling tweets” function from Twitter programs like Hootsuite, we wanted a simple-to-use script that would auto-tweet stories from our backlog. 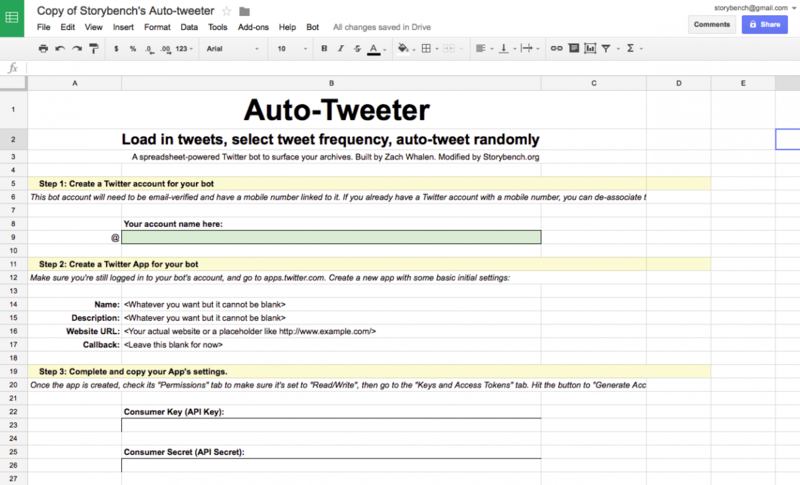 In order for your spreadsheet to communicate with your Twitter account, you need to set up a Twitter app. 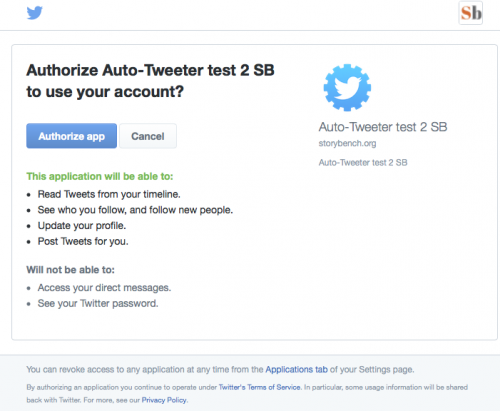 Go to apps.twitter.com and sign in with the account from which you would like to auto-tweet. 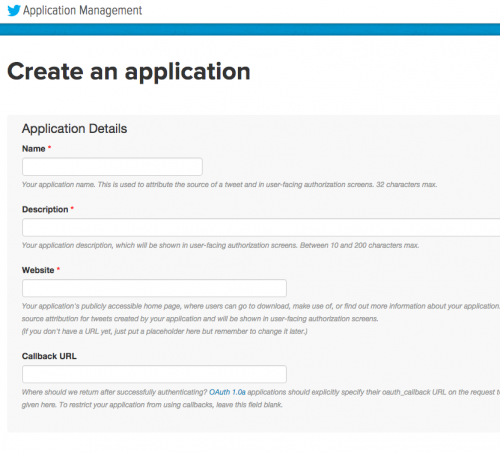 Give you app a name, description and URL. Leave the Callback URL field empty for now. We’ll be returning to that later. Agree to the Developer Agreement and create the app. 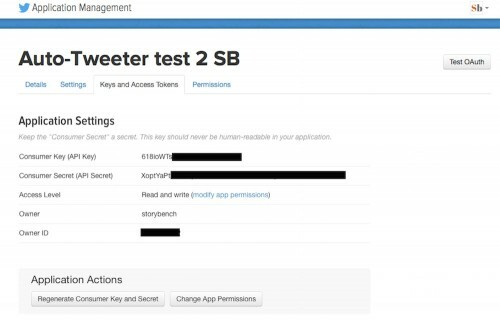 In order to communicate between your spreadsheet and the Twitter API, you’ll need to plug the API key and API secret (two long strings of characters and numbers) into your Auto-Tweeter Setup sheet. They can be found under the Keys and Access Tokens tab. Once in your script editor, find Project properties under the File tab. You’ll easily find the Project key here. Highlight and copy it. Paste the Project key into your Setup sheet. 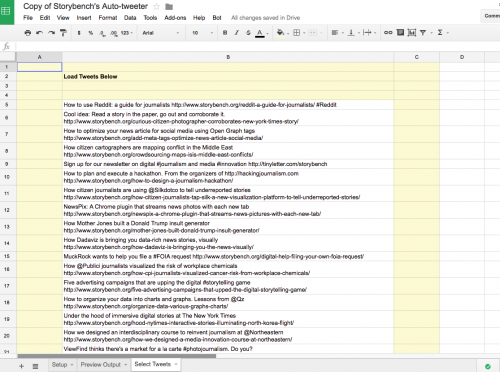 Once the Project key is filled in, the spreadsheet auto-completes cell B37. Cell B37 is the Callback URL and you should copy and paste this into your Twitter app settings back at apps.twitter.com. Find the Callback URL field under the Settings tab and paste it in. Save by clicking Update settings. 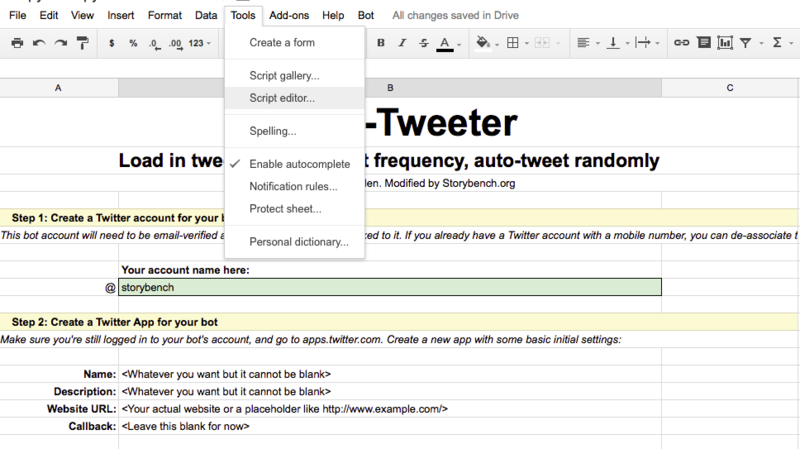 In your spreadsheet, navigate over to the Select Tweets sheet (which appears as a tab along the bottom). Start loading your tweets. 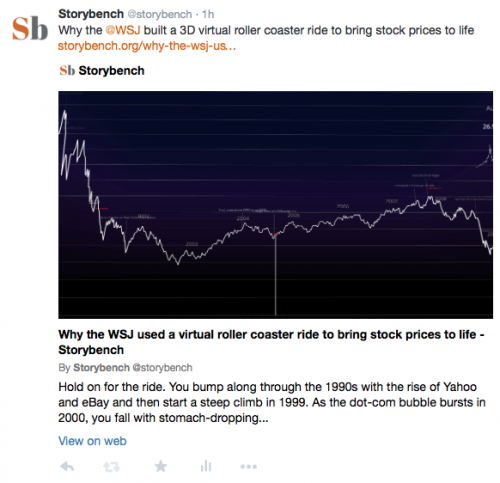 We loaded headlines and links from the 100 stories in the Storybench archive. In order to generate this list, however, you’ll have to authorize the scripts in this spreadsheet. When prompted, authorize the spreadsheet. You have successfully authorized your Auto-Tweeter spreadsheet. Click Send a Test Tweet again and check your Twitter timeline. Find cell B54 on your Setup sheet. 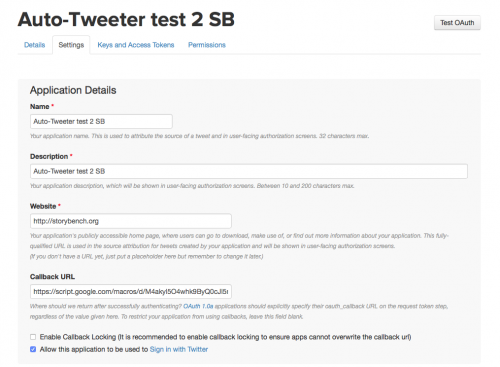 This will have a dropdown menu for setting the frequency of your Auto-Tweeter. It can tweet as frequently as every 15 minutes or as infrequently as every 12 hours. Finally, select Start Posting Tweets from the Bot menu. Done! As long as you have your Open Graph tags (social media metadata) loaded up, your links will become expanded links on Twitter and include a headline, a teaser, and photos. 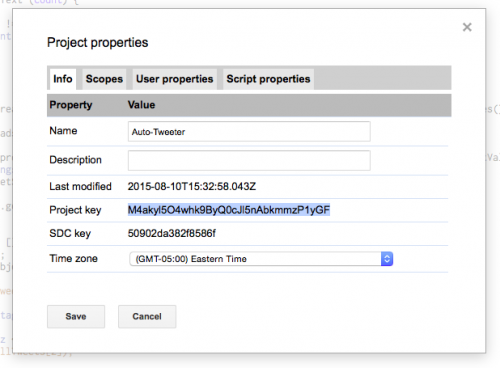 Read our tutorial on adding that metadata here. Zach Whalen built this bot and wrote a very helpful tutorial for it. 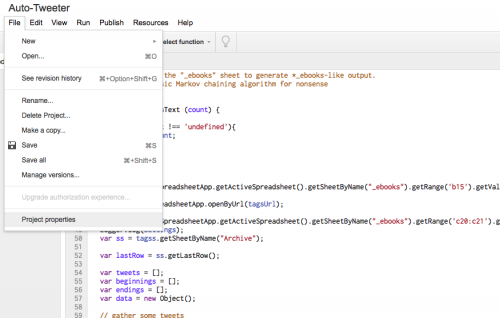 We’ve changed some of the copy and a few lines of code to adapt it for our Archive Auto-Tweeter program. Please head there for technical support and troubleshooting advice. So what will you use this Twitter bot for? Is auto-tweeting stories from the archive helpful? What are you automating with similar technology? Please let us know! Hi, the bot works quite well for its intended purpose but I am trying to tweak it to tweet the archive I have in order, then wrapping around and starting from the beginning again. I’m a beginner at code and I can’t seem to figure out how to do it. Do you by any chance know how to do it? i’m looking at the same thing Justin, and probably for the same reason, based on the time stamps. I am looking to change the time interval of tweets posting to 2 minutes . what will be the procedure to do that ? Is there a way to have the tweets appear in order as opposed to the randomized one that happens when generating the previews? New to coding, so just curious as to where to look. Thank you!